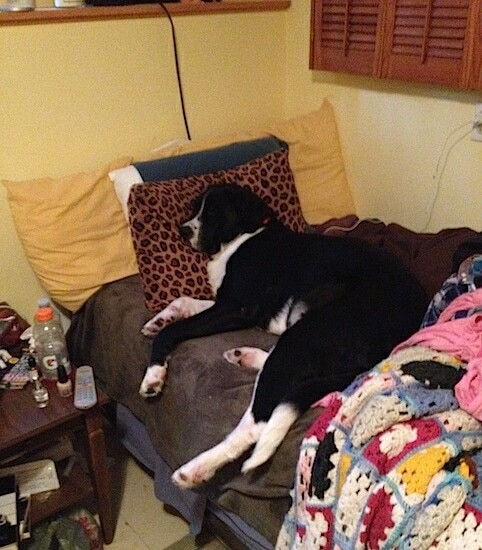 Minnie the Swiss Newfie (Greater Swiss Mountain Dog crossed with a Newfoundland) at 1 1/2 years old weighing 110 pounds sleeping on the bed—"Minnie is a Swissy and Newfie mix. She is just over a year and a half in this picture and weighs 110 lbs. Her temperament is amazing. 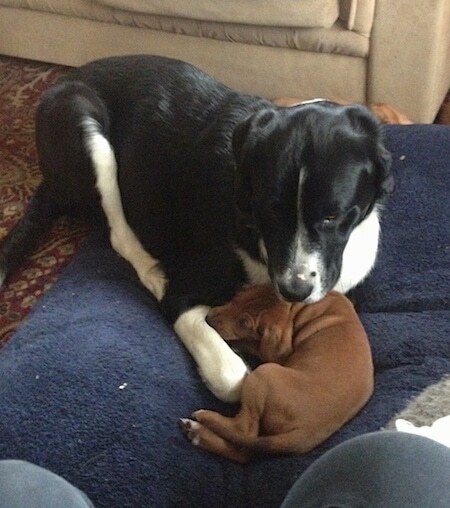 She is very gentle as you can see in the photo of her with a small puppy. She loves attention and playing and gets along very well with all other dogs. She was a very high energy puppy and had some issues with jumping up on people and can be stubborn at times, but has become calmer and more obedient with age. These dogs are very sensitive and can sense when you are angry or upset." The Swiss Newfie is not a purebred dog. 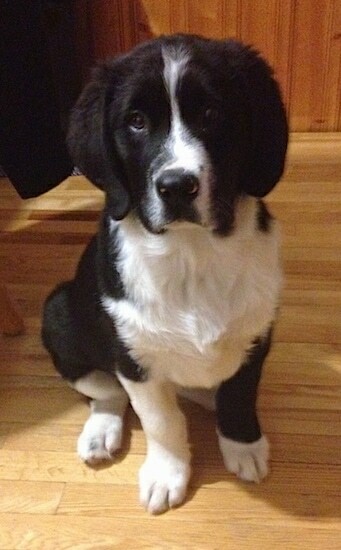 It is a cross between the Greater Swiss Mountain Dog and the Newfoundland. The best way to determine the temperament of a mixed breed is to look up all breeds in the cross and know you can get any combination of any of the characteristics found in either breed. Not all of these designer hybrid dogs being bred are 50% purebred to 50% purebred. It is very common for breeders to breed multi-generation crosses.